Laurie first experienced throwing on the wheel in a summer arts program at age 11. After talking her way into the studio as a freshman in high school, she had four years of practice under Don Hunt and Philip Lyons. Their instruction instilled a deep connection to the wheel, a love for making, playing and experimenting. Flash forward to 2013, Laurie found her way back into ceramics after seeking respite from work burnout. Neighborhood studio sfclayworks provided the classes and space to reconnect with clay, along with a community of fellow ceramists to push her work from from hobby to passion. 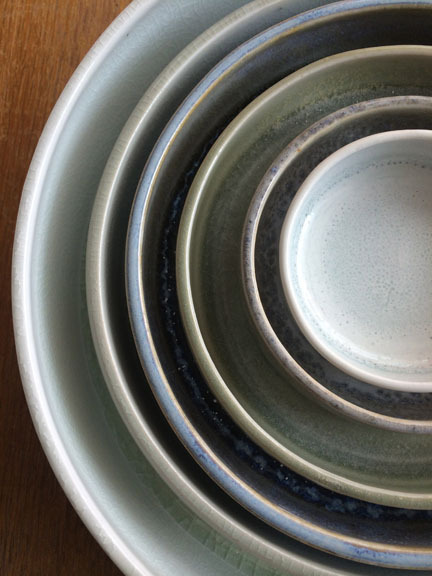 Focused on functional porcelain forms, Laurie draws inspiration from scuba diving and cloud-spotting. She’s excited to join the Hands-Up program and eager to delve further into mixing glazes and gas firings. The crew at sfclayworks is excited to bring Laurie into our Hands-up program at sfclayworks. We are looking forward to helping Laurie gain a broader knowledge of the ceramic arts.